A lot of focus goes into building-in efficiencies for fast-moving wine & spirit SKUs, and of course that makes a lot of sense. But, don’t stop there and assume that your slow movers can’t also be stored and picked with measurable efficiency. Mallard’s latest Engineered Application is Bottle Pick Rack, and it’s uniquely designed to deliver those efficiencies for each picks and case-building wine & spirits order selection. 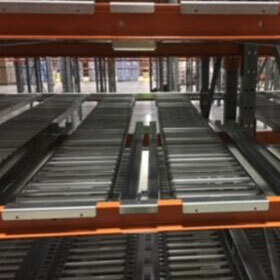 Slow-movers and each picks are often relegated to static rack, but Mallard bottle pick rack allows you to harness the economies of gravity flow rack… such as inventory consolidation, increased pick rates and accuracy, and automatic pick face replenishment even though you are selecting a single bottle at a time. The custom design safely secures individual bottles in single-bottle lanes, thus keeping SKUs well organized, easy to see and fast to pick. The bottle pick troughs decline slightly toward the pick face which improves product visibility and provides a more ergonomic positioning for pickers vs bending, reaching and lifting. Unlike typical flow lanes, bottle pick is designed for push-back loading from the front aisle, for dedicated dense storage of individual SKUs. As each bottle is picked, the rear bottles automatically flow forward to replenish the pick face. Bottles picked can be easily loaded into waiting boxes or totes on conveyor or pick carts. 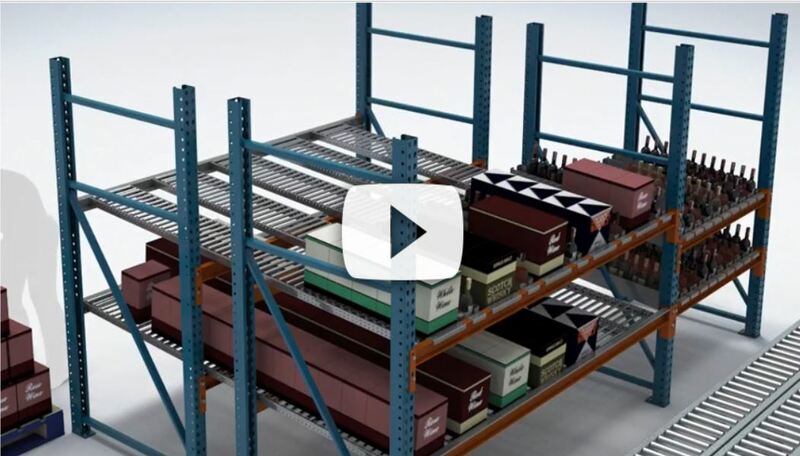 Bottle pick is easy to install by simply securing the individual flow lanes into standard selective pallet racking. It is available for 42” or 48” deep rack. You can also integrate the bottle pick rack with other carton flow and/or beverage storage shelving. 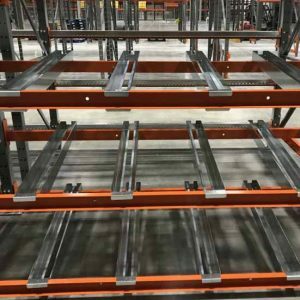 For example, a customer recently installed bottle pick rack in alternating lanes with Cart-Trak carton flow in an effort to consolidate slow movers and free-up needed warehousing space. The new design provided an orderly and efficient pick application for both moderate moving cases and slower moving each picks. The picker selects cases or bottles to a pick cart positioned in the aisle. For restocking, the carton flow is replenished from the rear aisle so as not interfere with the pick cart and since the bottle pick lanes are less frequently replenished, restocking from the pick aisle is not a hindrance. If you are interested in speaking with a gravity flow expert to explore our latest customized bottle pick application, just give us a call.